Why Choose South Dakota for Online Higher Education? By 2020, nearly two-thirds of all jobs in South Dakota will require postsecondary education. According to the state’s industry projections for job growth, the fastest-growing employment areas remain healthcare and social assistance; business management; and professional, scientific, and technical services. Many of these jobs require postsecondary degrees. 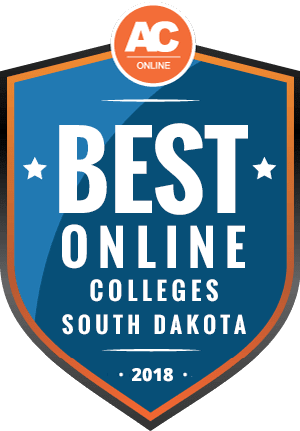 Use this guide to explore the most affordable online colleges in South Dakota, and learn why an online degree from this state might fit your needs, even if you live elsewhere. Learn more about South Dakota’s best online degrees, including transfer policies, financial aid, and how to enroll. In South Dakota, online learning opens doors to higher education for residents of this sparsely populated state. Agricultural workers, rural residents, single parents, and part-time students with full-time jobs, among others, benefit from the flexibility of online courses. The state promotes online learning through its public institutions. These state schools offer a variety of online programs at affordable tuition rates to students from any state. As a result, South Dakota’s affordable online programs attract students from across the state and around the country, as seen in the chart below. South Dakota’s public schools offer lower tuition rates for residents, and reciprocity agreements with neighboring states such as Minnesota can also provide lower tuition rates to some nonresident students. However, residency requirements do not typically apply to distance education. The South Dakota Board of Regents sets the same low online tuition rates at all six public universities. This rate applies to all online students, regardless of residency. As shown below, South Dakota boasts low tuition rates for all students, though out-of-state tuition at four-year colleges is higher for on-campus students. South Dakota’s in-state tuition for public four-year schools is slightly lower than the national average of $8,778, but the state’s out-of-state rate is less than half the national average of $24,354. Online courses at South Dakota schools typically cost only marginally more than on-campus courses, and some institutions offer the same tuition rates for both. See below some examples of affordable online programs in South Dakota. Non-South Dakota residents should visit the websites of their prospective schools to find out if they charge higher rates for nonresident students. Most do not, and South Dakota offers much lower out-of-state tuition rates than most states, even for traditional students. Students from nearby states can also benefit from tuition reciprocity agreements, though these do not generally apply to online programs. Regardless, South Dakota’s affordable online programs attract many out-of-state students, as demonstrated below. South Dakota participates in several interstate compacts and reciprocity agreements that can provide lower tuition rates to out-of-state students. However, these agreements may not impact tuition from schools that offer the same tuition rates to all online students, as many South Dakota schools do. South Dakota belongs to the Midwestern Higher Education Compact (MHEC), but it does not participate in its student exchange program. Instead, through the State Authorization Reciprocity Agreement, all public and private schools in South Dakota have the option to participate in a regional compact for western states through the Western Interstate Commission for Higher Education (WUE) — and many do. South Dakota received 1,761 students through WUE in the 2017-18 school year. Finally, Minnesota residents can benefit from a special reciprocity agreement with South Dakota, but this agreement may not apply to online programs. Each school in South Dakota may participate in the National Council for State Authorization Reciprocity Agreements (NC-SARA). Many do, and particularly those offering online programs to students from other states, because the agreement simplifies the requirements and fees for participating colleges. NC-SARA authorizes and oversees many of the online programs offered by schools in South Dakota. Here we rank the accredited online colleges in South Dakota that offer at least three affordable programs. We assess them according to measures that matter to students, including the number and variety of online programs offered, the net cost of these programs, and resources available to online students. When examining NCES data available for these schools, we analyze indicators of both quality and affordability. Explore our rankings to find options for high-quality, affordable online colleges. To learn more about online degrees in South Dakota, start by exploring this FAQ resource roundup. These FAQs provide information about costs and requirements. Do online credits cost more or less in South Dakota? Online universities in South Dakota typically offer the same online rates to all students. All six public universities, for example, charge the same tuition for online credits to all students, regardless of which school they attend or their residency status. Online credits in South Dakota rarely cost much more than credits earned on-campus. Online undergraduate credits at the University of South Dakota, for example, cost slightly more than in-state tuition for on-campus classes, but less than out-of-state tuition. Private schools, such as Dakota Wesleyan University, charge the same rates for both online students, on-campus students, and out-of-state students. Private schools typically charge higher tuition rates than public schools. Which South Dakota schools accept the most transfer credits? Four-year schools in South Dakota typically allow the transfer of two-year degrees as a block of earned credits, especially at the state’s six public universities. The University of South Dakota, for example, allows students to transfer up to half the credits required to earn a bachelor’s degree. For those transferring from one of the state’s four public, two-year technical institutes, articulation agreements with the state’s four-year schools establish clear transfer policies. South Dakota State University, for example, advertises many such agreements with schools in South Dakota and neighboring states. Most South Dakota schools accept between 25% and 50% of required credits as transfer credits. Some may accept more, but transfer credit acceptance remains the discretion of each institution. Dakota Wesleyan University, for example, accepts up to 63 credits from two-year institutions. The university only requires that transfer students spend their final year in residence, meaning students must earn 30 of their 40 final credits at DWU. Will any online colleges in South Dakota accept a GED? South Dakota views passage of the GED test as equivalent to earning a high school diploma. South Dakota’s undergraduate online programs typically accept a GED for admissions to associate and bachelor’s degrees, though some establish minimum score requirements. Dakota Wesleyan University accepts a GED for freshman applicants, as do South Dakota State University and Northern State University with specific minimum test scores, and the University of South Dakota. How many academic terms per year do online colleges in South Dakota offer? Some online schools in South Dakota offer eight-week classes, which start twice each semester, or six times per year. Dakota Wesleyan University and the University of South Dakota offer this type of schedule. Many schools offer online courses that span the length of the semester. No online colleges in South Dakota start as frequently as every week or month. Which online colleges in South Dakota will accept the FAFSA? Students enrolled in full-time programs at accredited online colleges in South Dakota may qualify for federal financial aid, just as on-campus students do. All schools with such programs use the Free Application for Federal Student Aid (FAFSA) to determine both online and on-campus students’ aid eligibility. If you plan to enroll in a full-time undergraduate or graduate online program in South Dakota, make sure you complete the FAFSA and apply for financial aid. Are there any free online classes I can take from South Dakota colleges? Some South Dakota colleges may offer a free online course or massive open online course, they generally do not. How can I find the online program options at South Dakota colleges? South Dakota’s six public universities use a learning management system for online courses called Desire2Learn. To find online programs at each school, visit each institution’s website. Of these colleges, the University of South Dakota offers the most online programs. Financial aid, including federal and state grants and loans, is available to full-time students who demonstrate financial need by completing the FAFSA. For those who do not qualify for needs-based aid, South Dakota also offers several scholarships intended to encourage college graduates to stay in the state and fill areas of critical need. Start your scholarship search below. This program seeks to encourage students to train as skilled workers in high-need workforce areas. Students applying for eligible programs at South Dakota’s four technical institutes can qualify, regardless of residency status, provided they agree to work in the state for at least three years after graduation. This scholarship program strives to enable academically accomplished students from South Dakota high schools to attend any accredited school in the state. Students with minimum ACT scores of 24 and GPAs of 3.0 may apply. Students with lower grades but higher ACT or SAT scores may also apply. Students with demonstrated financial need can receive grants awarded by the state. To qualify, students must complete the FAFSA and apply for financial aid through a participating technical institute, college, or university in South Dakota. This program aims to encourage talented South Dakota high school graduates to stay in the state for college and after graduation. Applicants agree to work in an area of critical need in South Dakota for a period of time equal to the number of years they received the scholarship, plus one. Students with a minimum ACT score of 27 and GPA of 2.8 may apply. This program’s goal is to supply the state with trained teachers in areas of critical need. Undergraduates in their final two years of an education program at a South Dakota school may apply, as long as they maintain a minimum GPA of 2.8. Applicants may reside in any state. Applicants agree to teach in a critical need area of South Dakota for five years after graduation.